I get asked from time to time whether the actions of central bankers influence the way the market moves. The “yes” part is that from 2009 to the present in the SP500 and related indices, we have a B wave, which is highly unusual; in fact, it’s remarkable . But, let’s look first at the bigger picture — using the DOW chart, because the data goes back the farthest. You can see that 1929 was the top of a (circle) third wave and that in 2007, we topped out at the top of the final (circle) fifth wave. 2007 was both a projected 172 year and a 516 year cycle top. We expected the market to crash then, with a downside target of the previous fourth wave of one lesser degree, at approximately $570 (shown as a white horizontal line). After the final fifth wave, the market always returns to the area of the previous fourth of one lesser degree (which means it will get close to that target, but might not reach it exactly). So, what happened — why didn’t we keep on going down in 2009? Central banks happened. Quantitative Easing, which was the injection of cash (with the Fed taking on the debt) into the commercial banking system “saved the day.” In terms of how it affected the market, you can see the B wave on the chart, which is a corrective (based upon its subwaves — what I refer to as “unnatural wave” because it was, in a way, “forced”). B waves at the top of a market are not supposed to exist. On page 58 of the Principle book, Prechter provides his opinion that this is impossible (“Erroneous Concepts and Patterns”). Ralph Elliott, on the other hand, believed they were possible. Elliott was obviously correct, as we have one across all NYSE related indices, obviously a result of the QE of central banks. 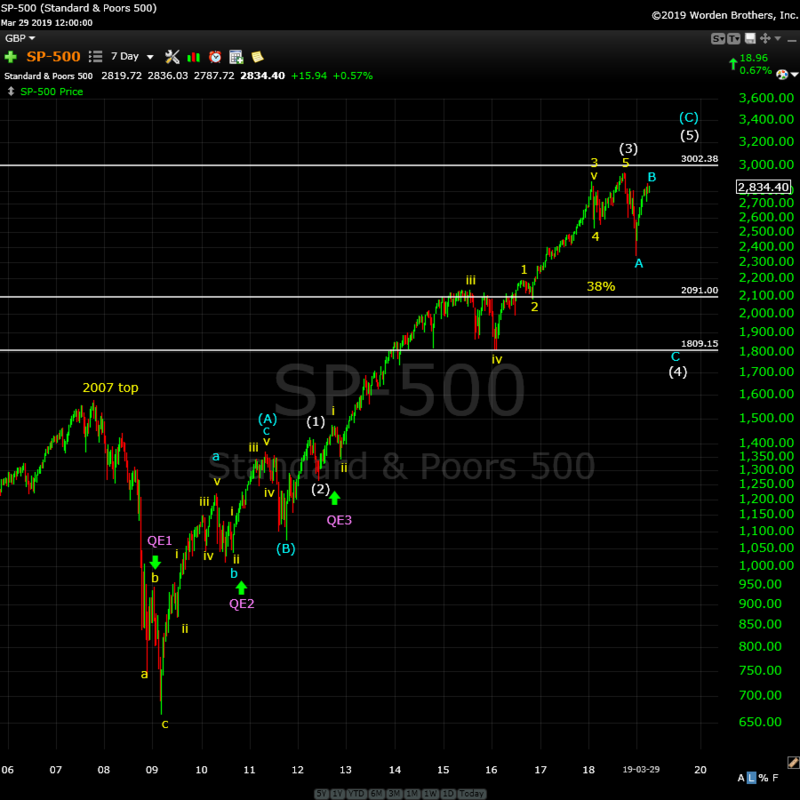 Above is the 7 day chart of the SP500, showing just the “B Wave” up from 2009. The “no” part is this: The subwaves all play out as they should. The “B wave” up from 2009 is a B wave because it’s clearly a corrective structure. Within that structure, Elliott wave principles hold true, as they always have and always will (until proven otherwise). The planets still revolve as they always have (and hopefully always will), influencing the emotions of humans on this tiny revolving rock called Earth, so the waves play out appropriately to the beat of the Universe. I have seen no anomalies in the wave structure up from 2009 and I’m doing analysis daily at all degrees of trend across multiple assets classes (and following international indices). The market was affected in each instance — QE2 and 3 had the effect of pushing the market up. What’s interesting is that they happened at points of relative weakness, but didn’t really affect “the count.”QE1 was a different story, but still had a major influence, as the chart below shows. Above is the daily chart of the SP500 (click to enlarge) spanning the period of mid-2007 (the top of the bearish wave down) to mid-2009 (a few months after the wave bottom). What’s important here are the purple letters. This is a zigzag. There’s a purple A wave down of five waves, then a purple B wave in three waves, and finally a purple C wave that is exactly 2.618 X the length of the A wave, a typical length for an extended C wave. There are no fourth and fifth waves. In fact, you can see that the wave structure changes near the bottom as QE1 kicked in. The drop from the high in 2007 began as a set of impulsive waves, but didn’t complete near the bottom (that where the stimulus began — QE1 began in December, 2008). 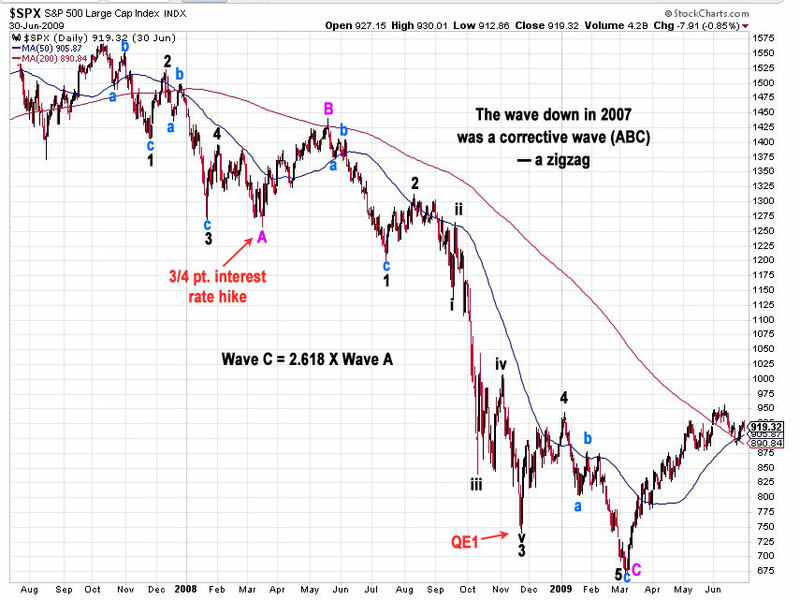 As a result of QE1, the next set of waves down became a “three count” — an ABC ending wave. What had begun at the top as an impulsive set of wave down (wave 1 of the start of a larger downturn) changed at that point into a corrective wave. Almost everyone missed this event, but it’s a clear indication as to how Elliott Waves are predictive. So the entire wave down must be classified as a corrective wave. Although I didn’t pay all that much attention at the time, it predicted another wave up to a new high. We’re getting closer to the top of that “induced” B wave now. Although, we have one more all time high to go, the fifth and final wave. [addition – PT] These “stimulus events” by central banks usually (if not always) take place at wave lows (additions on the above chart are in red). So, you can see that at the Federal Reserve March, 2008 meeting, after a surprise announcement of a 3/4 of a point interest rate cut, the market turned from the bottom of the first wave (or A wave — after 5 waves down — which is the normal place for a rally). The market first dropped a bit and then rallied 184 points to complete the second wave (top at 1440). At that time, the Fed also allowed brokerage firms (for the first time ever) to borrow money directly from the Fed at lower rates, Well, we know where that money went! They actually cut the discount rate for banks twice in a three day period! Likewise, in November, 2008, QE 1 was announced at the bottom of the third wave of the C wave and immediately rallied again (at the appropriate spot in the wave structure). However, the rally was short-lived and resulted in another low to complete a C wave before a much larger rally up, which has become our large B wave (where today, we’re in a large 4th wave close to a top). Following from this, if we’re going to get QE 4, I would expect to see it at the bottom of the fourth wave, when we’re under the 2100 level that I’m predicting. In summary, central banks have affected the direction of the market overall (creating a B wave to new highs that we not expected at the time). But the waves reflected that financial injection and predicted another wave up. But, the subwaves not affected; they still trace out their patterns as if nothing happened; they continue to follow the rules of the Elliott Wave Principle. The market is influenced by the movement of the planets but nobody’s done anything to change their timing or orbits. The market will continue to play out as it always has, hitting fibonacci ratios on schedule and tracing out Elliott Waves that are as predictable as they’ve always been. Here is a page dedicated to a relatively basic description of the Elliott Wave Principle. You’ll also find a link to the book by Bob Prechter and A. J. Frost. We're still sitting near the top of a B wave that's risen to about the 76% level of the height of the previous set of waves down from the all-time high at October 3, 2018. Almost all the other assets I cover on a daily basis are hovering near inflection points. The US indices are are working getting all "the gang" to a new high, as predicted in past weeks; progress is slow. That's because all asset classes I cover have to top (all the same market) before we they can all head down in tandem. As I've been saying, IWM (Russell 2000) and the DOW both need new interim highs before everything heads down in a dramatic capitulation. The US Dollar Index also has another leg down before it turns up in earnest. We're in the final bullish 5th wave in ES - a minimal new high to finish what appears to be an ending expanding diagonal. The next major move is to the downside. As I've been saying, the wave up from Dec. 26 is clearly corrective and, as a result, must fully retrace. This is supported by the US Dollar Index, the major USD currency pairs, WTI Oil, along with DAX and other international exchanges. Summary: My preference is for a dramatic drop in a C wave to a new low that should begin sometime this week. The culmination of this drop should mark the bottom of large fourth wave in progress since January 29, 2018 - over a full year of Hell. It may be a dramatic drop that lasts multiple months, and will target the previous fourth wave area somewhere under 2100. Once we've completed the fourth wave down, we'll have a long climb to a final new high in a fifth wave. 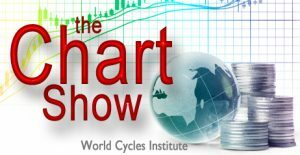 Get caught up on the market from an Elliott Wave perspective. There’ll be a Q&A session during and at the end of the webinar and the possibility (depending on time) of taking requests. that will be crazy..for oil..but a great trade..
Wow, I can’t believe Charles called another target: ES just hit 2895. I’m really amazed. Not sure if his 2,900 or 2940 targets will be hit. Peter is saying we are so close to a top. I’m finally on the right side of the market. Yay! I think Charles may be right with the markets going to new ATHs. Yep Trump is calling for more QE now too. The bullishness in markets is reaching monstrously high levels and every man and his dog are buying shares. This is requirement for the sharp reversal we should see as per Peter’s analysis. The more the bullishness the bigger the crash and that is needed as we have a 1000 point S&P drop ahead of us. By all means keep buying the dip as the market may have higher to run but please ensure you have a stop loss in place in case of a catastrophic drop. I must honestly say I don’t really have any confidence in the bearish thesis at this point. I know there will eventually be a day of reckoning with this rally, but I think Peter’s count is off or something. I bought some ETFs this week and hope the markets continue up for a while. Charles was able to predict this upward movement months ago. Go Charles Go! How was his Elliott wave count so different from Peter’s? That’s why I’m so on the fence about Elliott wave theory and it’s predictability as it relates to the capital markets. And why is Charles being “moderated” when he was so accurate? He is being moderated because he is very confrontational at times and criticizes people who have different views to him. Whilst Charles has been correct about the upward trend he was not able to predict the down trend into December. When we do get the next down trend i will be keenly waiting for Charles’s predictions to the downside and the specific targets. If he can nail those i will very impressed. Oh I’ve always seen most of Charles’ comments as helpful. He seems to be a very good trader based on what I’ve followed. His 5-min chart approach is the real deal. Maybe Peter doesn’t like that Charles was getting all the attention? Either way, it’s his blog so I truly understand the nature of the beast. He is free to comment, of course, if he adheres to the guidelines. The way folks are talking on this site about the bullish market it reminds me of the dot com bubble. Back then all were saying it is a new economy and the market will magically go up and up. Guess what happened next!!!!! What happened to “free speech”? We can only agree with you but can’t disagree with your wave count? Are you that dense? When you criticize people for no apparent reason and post comments with absolutely no educational value, I will delete them. Let me spell it out. This is a business. If you sat in the lobby of your doctor’s office and criticized his work for everyone to hear all day long, you would no doubt be escorted out. yet this is a B wave . 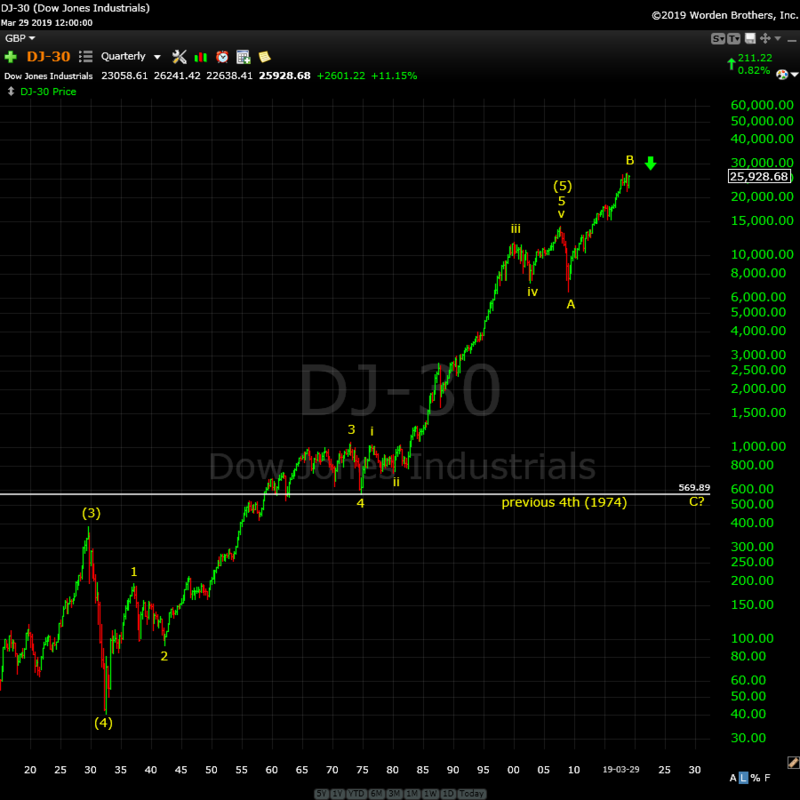 The impulsive move I have been counting in the dow heavy weights as much as id like to change the wave count, I cannot change it . Call me stubborn but the Jan 22 lows in my view need to be re tested . This Group is sitting Below Their respective Feb 25 high today . another ATH set on Dec 3 2018 before the big down move. The most recent high was March 19 2019, A lower high on April 1 and another lower high today. The stocks that make up the dow may as a cumulative create a new all time high but the individual stocks with in the dow are not making new All time highs . The move since then is therefore a B wave . Going back to 25,625 would be a must . Going back to 24,244 I still think can happen. last week of april- Early may for me is best time to take on any shorts. A few years back I noted the End of Quarter Plus 20 days scenario that had played out several times . April 20th ??? I do not know, buts its probably the start of something. Last thought don’t quote me : What began as an impulsive looking move from the dec lows has morphed into a lot of 3 wave swings which I can only call Slop. Going back to the Jan 22 lows so we can have a do over would clean up the wave count as far as im concerned . New all time highs even if they do come ( and probably will ) will not change the fact that we have 3 wave swings so it cannot be labeled as an impulsive move . This also opens the door for a much stronger decline later in the year . My bet is regardless if we see dow 30,000 or 38,610 at some point in the future the dow goes back to those Jan 22 Lows at 24,244. For now though im following the weekly chart and im going to patiently wait out Most of april before getting to excited about this market . Ill post 1 chart at the end of the day today to show what im following . with a warning. Don’t trust anything I think or say . do your own research, past performance is not indicative of future results etc. Doesn’t apply to you, Joe. But I’m getting tired of this. This is worse than noise; it’s just crap. People’s kids! Please realize Peter T created this site for educational purposes. He also has allowed us to post on this blog . Be respectful or we will all lose our ability to share information . My kids are 29 and 30 soon to be 30 and 31 . I remember one day when they were young . I told my son please stop acting like a 3 year old. He says back to me , but dad I am 3 years old . at which point I laughed and said I know . I don’t remember if we spoke about this ..question to all.. I guess I still see a possibility for another sharp 3 wave pull back.. then another possible 5 wave up for another 3 wave to D? is that possible Peter? then a giant drop to E…. OR…because of the time length of this correction make that not possible..
Yikes! 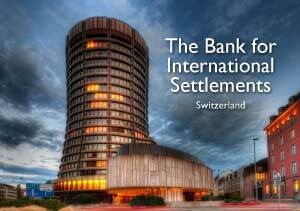 Everyone is starting to get bullish? When I was a young man at sea, I learned that you have to evenly weight both sides of the boat or it tips over. When everyone is on the same side of the market? We all know what happens next. Just a question of when, which we all can concur, is the million dollar question. Stay focused Golden Traders: Peter steers a lean and mean ship! Never in my wildest dreams did I think you’d be right, but I’m eating crow now. I personally thought 2820 would be the maximum height of this wave up. Your 2850, 2880, and 2895 were dead to center. Great calls. Simply astonishing! Not going to bet against your 2900 and 2940+. I’m a fan! a reading at or below 4.00 is the typical for an overbought reading. Many times the 4.5 – 4.25 readings tend to work . This is a very very short term indicator and its saying we may have made a short term high today . 5 day moving average of the daily trin changed directions today giving a warning sign . 5 day and 10 day $add at plus 796 and plus 680 are now into their own typical overbought zone . Up Vol minus Down vol is diverging ( bearish divergence showing ) and is also into its respective upper range giving another overbought reading . These indicators are used for short term trading only . No chart to post today . the market ( dow ) does not break above this weeks high yet also fails to break this weeks low . None of this to me gives me anything to go by longer term . I still favor a higher market into august 13 – sept 6th . Peter T has given us a roadmap for the market which imho is based on sound EW analytical acumen. Yes, he has been early in his expectation of a market decline, but a plethora of other market indicators suggest a substantial decline is indeed coming. Keeping in mind the purpose of the site is to be educational, here is my suggestion for an exercise that might replace useless sniping. If we were able to suspend bullish giddiness for a moment and posit that Peter T is correct, how, again for educational purposed only, would you trade an SPX decline of almost 1K handles? I have expressed my own interest in a long vol trade. I am also looking at delta for a number of ETF put option contracts and the trading universe is rich with opportunity. We are here to encourage and learn from one another, and there are some very savvy folk who post here. Let’s try not to foul the nest. Be gracious to our host. And have a restful and enjoyable week-end! Mr Verne..many pin me as the bull..BUT imma neitha a bull nor a bear..simply a trend follower..
imma uber bullish when price action is to the upside & uber bearish when prices r breakin bad..i simply use support & resistance zones & know when my tech indicators tell me to b long or short.. Even..i..with my keen bullish eye..can see that this run..will NOT go foreva..i called 2850..2880..& 2895 & hit da bulls eye..BUT as you say Mr Verne..there will b at least a 200-300 point pullback..BUT it will take volume & breaking major support levels..
Imma tempted to look at some late June deep outta $ puts for spy & qqq..add some uvxy calls..its betta to be a little early..than a little late..
i didnt do as well..as i woulda liked in the dec decline cuz vol jumped making option prices much..more expensive so buying when volatility is low gives ya more bang 4 ya buck! I really like SIR PETERS work cuz it gives me anotha perspective..my technicals dont tell me what wave counts are supposed to do..so its just 1 of my many tools i keep in my toolbox..
i 2 wish peeps would b more respectful of all the time SIR PETER puts in..showing his count..& much more of the background..which BTW..is much more than MOST EWers do! Plus its a free blog..dont spoil the milk & honey!